You are here: Home / Distribution / Maly’s of California, Inc.
Maly's of California, Inc. ("Maly's") supplies 30,000 hair salons in the western region of the United States, with business operations that include 340 sales representatives and over 100 professional retail outlets. With announced revenue of $187 million, Maly's was the largest, family-owned professional salon distributorship in the U.S. and the third largest overall. Maly's products include L’Oreal Professional, Redkin, Paul Mitchell, Matrix, PureOlogy, Schwarzkopf, American Crew, and Farouk. Maly's engaged M&A Capital to assist them to maximize their shareholder value in a consolidating industry. L'Oréal USA, Inc., a subsidiary of the world's largest beauty company, had completed the acquisition of an eastern U.S. professional salon supplier, Beauty Alliance, earlier in the year. 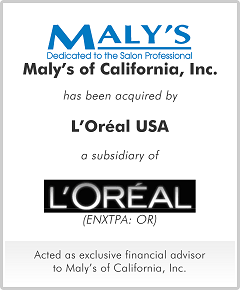 Maly's shareholder determined a sale to L'Oreal both provided the company with a strong partner and maximized shareholder value.